Beyond the issue of digital exclusion, greater insight into how different people are using the internet can only be a good thing and another tool that communications team can use to ensure that their messages are being delivered in the right way to the right people. This information could be used across the public and third sector to identify the most appropriate channels to communicate through, measure uptake of digital services and target digital literacy programmes. 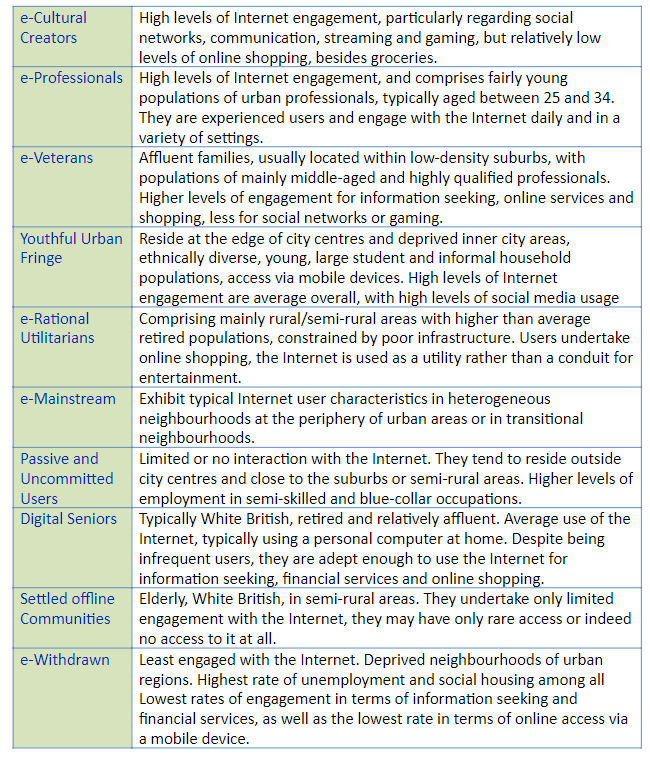 The ESRC Consumer Data Research Centre (CDRC) at UCL has developed a Classification of Internet Use – how people living in different parts of the country interact with the internet. Although this dataset alone doesn’t fill the data gap and can’t answer all questions relating to digital skills, it is great to see datasets that tackle this issue at a small area level. 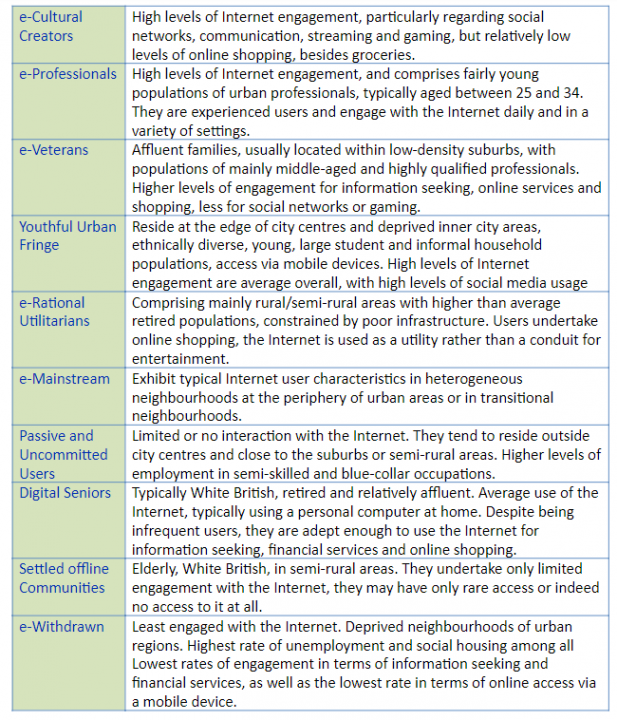 It is equally great that the data is updated regularly, providing an up-to-date picture of internet use, as well as insights into how areas are changing over time. We have also added each of these classifications into our tool Local Insight. As we have mentioned previously, these datasets give a really important insight into how people engage with the internet – but they are not the whole story. Local Insight provides instant access to more than 900 local level datasets, to help you gain a fuller picture of local communities, whether that is to target communications more effectively or to ensure that resources are being targeted towards those most in need. 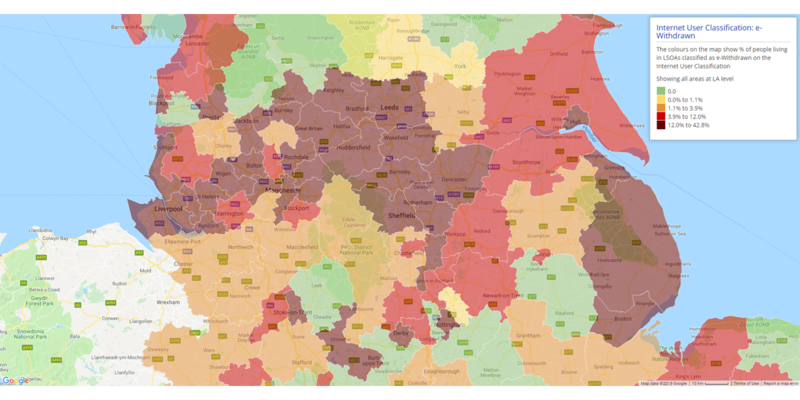 Local Insight also aggregates all of this data to the areas you care about’ whether that is wards, parishes, parliamentary constituencies or a town centre. Take a look for yourself by requesting a free trial or get in touch with the team on info@ocsi.co.uk.